The two hour ride in his new wheels was gorgeous. Japan has been experiencing an unusually warm start to the winter and "kohyo" (the leaves turning their glorious colors in the Fall) was in full bloom. By the time we got to the hotel, our spirits were full from the natural visual feast, and the hotel itself was a whole nuther experience. Yuki had taken care of all the details and we just came with bags in hand to a room in the executive suite where, once off the elevator, I was directed to choose my own yukata, obi and bow (they had an assortment of colors and patterns), then they led us into our MASSIVE suite with a bedroom with two tatamis already set up, dining area and living room, bathroom, and our own outdoor natural cedar onsen (natural hot spring). It was unbelievable. Yuki left us in our room to enjoy the room, dip in the onsen, and just relax, then picked us up several hours later for dinner to take us to an old style Japanese restaurant that seemed to be known for their unagi (where was Gene?!) where we had our own private tatami room -- Yuki explained that the owner is the third generation to lead the restaurant. The food was unbelievable, and while unagi is not my favorite dish, this restaurant changed my opinion completely and was the best I have ever had. I also ordered some ume-shu (plum wine) on the rock, the "rock" being a natural ice which Yuki explained is only made in three areas of Japan, this being one. Yuki then took us for a little "kisa", mostly for him and Sasha to enjoy some after dinner drinks (they had Japanese first malt whiskey) where the owner turned out to be jazz fans and brought out my mother's first big band album, "Kogun" in vinyl form. We were done by the end of that night. The next morning, we had a kaiseki-style Japanese breakfast, again in our own private dining area ouside of our room that was absolutely decadent, then was met by Yuki's friend, who turned out to be the building and interior designer for the park, who took us to the park. I just realized this blog is becoming ultra long with all my explanations so at this stage, I'll just say look at the pictures. It was really an unbelievable experience. We all changed into Edo period clothing: Sasha became "the last samurai," I became an "Edokko," and Nikita was "the blue ninja." We saw shows, and Sasha was even chosen from the audience to partake in one of them (Yuki of course set it up) where he played the patron to a high end oiran (geisha) that was hysterical. What Sasha and I couldn't get over was how authenticate all the buildings and the feeling in the park was, to really make you feel like you were standing in the middle of a real village from that era, no weird hype or neon lights, ultra natural. The landscape was amazing as well. Later Yuki took us to another area of the park that was off limits to visitors and used as sets for movies and television and explained that his father loved Japanese gardens, and each plant, tree and bush was planted in what was originally a barren land. Just breathtaking. Sasha was so inspired that he immediately plugged into Yuki saying we've got to do some sort of music festival there, which Yuki seemed to be excited at the prospect of. I feel funny doing a plug with a friend, not wanting to appear to be taking advantage of a friendship nor mix pleasure with business, but who knows, maybe this could work. It certainly is an inspiring stage. We spent 6 hours in the park but only managed to see half, which tells you just how massive this place was. The next day after another crazy breakfast and then checking out of our hotel (Nikita kept saying, "I want to live here! 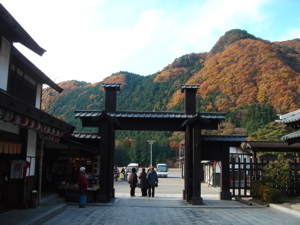 "), Yuki took us to the most famous shrine and temple in Japan, a national heritage, called Toshogu. It was created by the first shogun to deify himself and houses his tomb. The place was MASSIVE. After a LONG walk up some steps, we finally got to...the gate. From there, it was a series of temple and shrine buildings that were each more impressive as the next. I kept asking, "Is this the main shrine?" No. "Is this it?" No. After the 20th building, I stopped asking. We finally got to the main shrine which we weren't allowed to photograph but were allowed inside of, and then went up 200 stone steps to the shogun's tomb. Again, this place was so huge that we just couldn't see all of it -- Yuki explained that there were more shrines that was as laviscious as what we had just seen. A true marvel. We drove back that afternoon to Tokyo and checked into the Westin, hung out in our room and the Ebisu Garden Plaza across the way, then met up with Yuki for sushi at Sasha's favorite spot in Tsukiji (the big fish market). Actually, Tsukiji is going to be moving to another area of Japan soon, an end of an era. We had another day in Tokyo that was mostly spent eating (more sushi), walking around, picking up Sasha's custom made mouth piece at Yamaha and going to a famous toy shop in the Ginza area. We left Japan with a feeling like I've never had before. It was pure and decadent joy and luxury. Sasha was fished out for the first time in his life I think and still to this posting refuses to eat fish. When we got to the airport and our departure gate, we found Seamus and Fima sprawled out on the chairs fast asleep. They had spent those extra days in Bali, just touring around on their rented bikes and having a great time. It was good to see them and we all shared photos and stories. Overall a great trip! This week back has been a little rough and I've not been able to work at all. We were committed to do a birthday party for Nikita days after our return which entailed a lot of planning and preparation, and my cold has turned out to be one stubborn virus that refuses to go away. And it's the usual battle with the jetlag -- I keep losing it at around 8:00 p.m. and waking up by 2:30 a.m. We'll get there.